The Secret of the Hidden Scrolls series follows siblings Peter and Mary and their dog, Hank, as they discover ancient scrolls that transport them back to key moments in biblical history. In the series' fifth installment, the time-traveling trio wind up in Bethlehem, where they quickly befriend a young David. When David brings food to the Israelite army, Peter and Mary go with him and witness the mighty taunts of the giant Goliath. As the clock runs out, Peter and Mary uncover a treacherous plot, help David prepare to face Goliath, and battle a mischievous and familiar enemy. Children will be on the edge of their seats as the larger-than-life story of David and Goliath hurtles to a close. 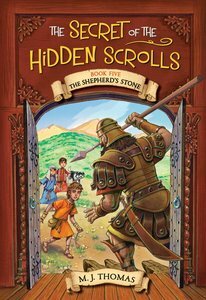 About "The Shepherd's Stone (#05 in The Secret Of The Hidden Scrolls Series)"